The Department of Economics and the Booth School of Business have created a joint proposal to introduce a business economics major to the College. John List, chairman of the Department of Economics, said the major would be “economics with a business flavor” and would allow students an increased amount of specialization. According to List, the major would be “more applied in nature” than the current economics major. List has presented plans for the major to several faculty committees, but does not know when it will go to a vote. The College Council, a group of 40 faculty in the College, would be ultimately responsible for deciding to implement the major. (This organization is distinct from Student Government College Council, which consists of undergraduates.) A spokesperson of the College Council told a Maroon reporter Thursday that proceedings of the Council were confidential but that this issue would be within their jurisdiction. 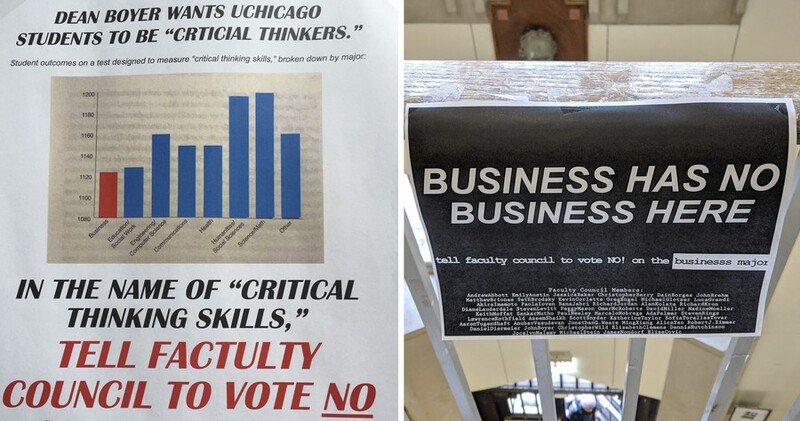 Posters have gone up across campus urging professors to vote against the new major, although the individuals behind this campaign have not identified themselves. Additional reporting contributed by Hannah Edgar, Euirim Choi, and Pete Grieve. The closed vote will take place at 3:45 p.m.